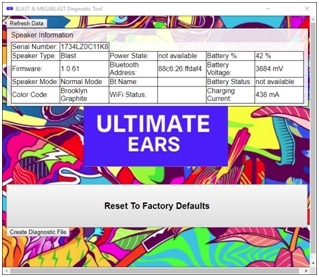 How do I update the software on my ULTIMATE EARS BLAST? While it is quickest and easiest to update over-the-air with the app for your ULTIMATE EARS speaker, if you can’t update using the app or you simply prefer to use an old-school desktop updater, we’ve still got you covered. Click on the Mac or Windows download link below to download the update utility. After you download the app, run it and follow the on-screen instructions. You’ll need to connect your ULTIMATE EARS speaker to your computer to complete the update. How do I pair my speakers? From the app: open the app and tap on the button at the bottom of the screen with two speakers in it. You see a brief tutorial and then be taken to the grouping screen. One speaker will already be visible in the middle of the screen. After a brief moment, your other speakers (that are powered ON) will appear at the bottom of the screen. Simply drag any of the speakers from the bottom of the screen to the middle of the screen and the pairing process will begin. There is a short delay while the speakers synchronize. To add additional speakers to the group, just drag up another speaker from the bottom of the screen and after a short delay that speaker will join the group. From the speaker: First power ON all the speakers you want to pair. 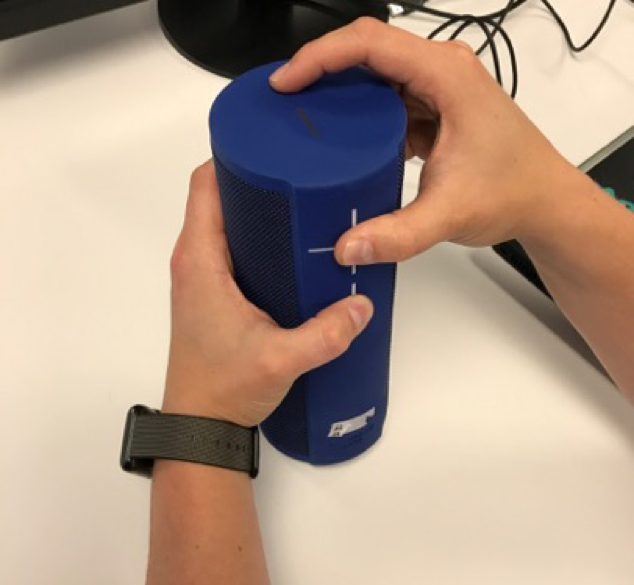 Take one of the speakers and briefly press the “+” button on the front of the speaker and the Bluetooth/action button (the small button on the top) simultaneously. Next, take your second speaker and press the Bluetooth/action button twice. After a short delay, the two will be paired. To add additional speakers (up to 8), just repeat the second step, double-tapping the Bluetooth/action button to add them to the group. Go to your phone’s Bluetooth settings and in the Paired Devices list, unpair the speaker. The steps for doing this may differ depending on your device. For example, Settings > Connections > Bluetooth > Tap the gear icon > tap Forget device. I tried to pair my speaker to WiFi and now it says the speaker disconnected? In which countries can I use BLAST and MEGABLAST? 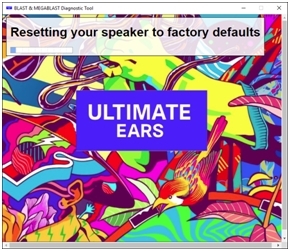 BLAST and MEGABLAST can be used in any country as a Bluetooth speaker. Android To close and then restart the app on an Android device: 1. Tap the Overview button. The icon is generally a square or two overlapping rectangles. It can be located on the bottom left or bottom right depending on your device. This will bring up all recent apps and apps running in the background. 2. In the list of recent apps, find the Ultimate Ears app. 3. You can either tap the “X” on the app or tap, hold and swipe the app off screen — this will also depend on your device. 4. Find the Ultimate Ears app and tap it to relaunch. iOS To close and then restart the app on an iOS device: 1. Double-click on the Home button to bring up recently used apps. 2. Swipe left or right to find the Ultimate Ears app. 3. Swipe upwards on the Ultimate Ears app to close it. 4. Find the Ultimate Ears app and tap it to relaunch. What if I buy my speaker in one country and travel to another? Alexa can be used on your BLAST and MEGABLAST speakers in the US, United Kingdom, Germany, Austria, Australia and New Zealand. In order to use Amazon Alexa, you will need to accept Amazon’s terms and conditions for the service. If the Amazon sign-in fails, something may have gone wrong while transferring your Amazon account credentials to the speaker. Quit the app and try launching it again. Why did the app skip the Amazon login during setup? You’ve already signed into the Amazon shopping app on your mobile device. If this happens, sign out of your Amazon app then follow the steps below to sign into your account from the Ultimate Ears app. In the Ultimate Ears app, in the top right, tap the Gear icon to go to speaker settings. Find the Amazon Alexa section and tap it to sign into your account. Tap Sign In to add your Amazon account. What is the difference between Amazon and Alexa? Amazon owns and operates the Alexa voice service as a convenient voice assistant for customers. Alexa is meant as a tool to perform requested actions and get information, whereas Amazon.com is an online shopping site. Alexa can be used for shopping on Amazon, but it's not exclusively for that. Do I need an Amazon account? You must have an Amazon account to use Alexa. What is the speaker’s Bluetooth name? 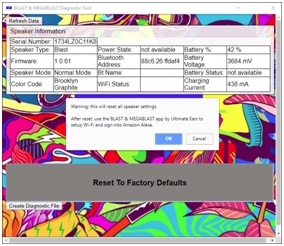 If you connect your speaker to your device through Bluetooth, the display name in your device’s Bluetooth devices list will be either BLAST or MEGABLAST. Once you’ve connected, you can change the name of your speaker from the app. With the speaker connected, open the app and in the top right, tap the gear icon. You can then change the name of your speaker by tapping on the Speaker Name field. Do I need the app to connect through Bluetooth? You can connect to Bluetooth directly, but we recommend using the app for the best experience. You’ll also need the app to connect to WiFi, use Alexa and update your firmware. Why do I need to sign into Amazon? I can’t sign into Amazon. why? My speaker failed to pair to my phone over Bluetooth. what can I do? My phone can’t find speaker on during Bluetooth setup. what can I do? The app is stuck telling me the speaker is restarting. what do I do? Get an error message during pairing, what do I do? The app doesn’t see my speaker during setup why? What does waterproof IP67 mean? Why can’t my Android device connect? Is the volume synchronized with my phone? Can I revert my firmware to previous version after I update? How do I clean my speaker? My speaker isn’t playing music why? How do I get a spare D-ring? Connect POWER UP to the micro USB cable and power adapter that was included with your speaker. POWER UP is not compatible with iPhone chargers. How do I get a spare charging cable for my speaker? How do I get a spare power adapter for my speaker? Can I use my speaker when its cold? Can I use my speaker when its hot? 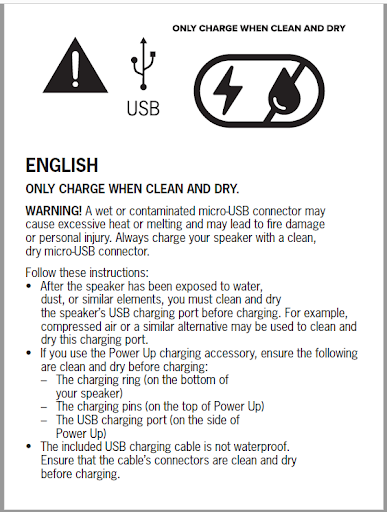 Can I use my speaker in the water? What do the different lights on my speaker mean? Can I connect my speaker via 3.5mm? Can my speaker work with my other ULTIMATE EARS speakers? How long does it take to charge my speaker? How do I charge my speaker on the charging dock? Designed to work with charger included with speaker, not compatible with iPhone chargers. Open the sealed weather door on the bottom of your speaker to locate the micro USB port — you do not need to remove the D-ring. NOTE: Designed to work with charger included with speaker, not compatible with iPhone chargers. Can I play local content from my phone on my speaker? How do I play Apple Music on my speaker? How do I setup a Group of speakers? How do I connect multiple speakers? Can I control multiple speakers in the app? Will Alexa work on bluetooth? Will Alexa work on WiFi only? Do I need to connect to WiFi or can I connect to bluetooth only? You can use any music service as long as you have the app. What happens when i’m out of range of my WiFi? Will my speaker automatically reconnect to my WiFi? Can I connect to multiple WiFi networks? The app can’t find my WiFi network at work (enterprise) why? The app is required to set up your speaker, to update your speaker with necessary updates, to connect to a WiFi network, and to set up and use Amazon Alexa. If you don’t plan on using Amazon Alexa, you’ll only need the app for the initial setup, download the required software, and to perform periodic updates. 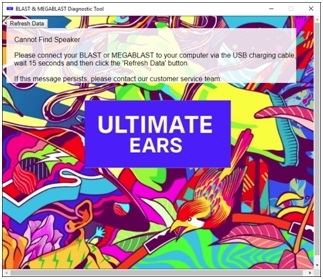 Internal -- Agent Resource Firmware updates can only be done with the Ultimate Ears App. A firmware download utility will NOT be available for Mac or PC. How do I change the name of my speaker? Your speaker has an alarm feature through Alexa. When you are signed into Alexa, you can ask her to set an alarm, set a reminder, or a timer, and the speaker will wake and play the alarm or timer at the requested time. How do I add a speaker? The Equalizer can be accessed from the home screen of the Ultimate Ears app (the speaker must be connected). Just tap the Equalizer icon. Once you're in the Equalizer settings, tap the left and right arrows to scroll through the different presets. You can also select Custom to manually adjust the settings. Is there a way to have my firmware updated automatically? How do I know I have the lastest firmware? To check your speaker’s firmware version, go to the Speaker Settings section of the Ultimate Ears app (the gear icon on the top right of the app home screen). Scroll down to the bottom of the page. 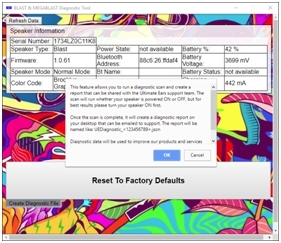 The app will display the current firmware version and will automatically check if there is newer firmware available. If the auto-update setting has been disabled or if you’re just curious, you can always tap the “Check for Updates” button to manually check for software updates. The first time you set up your speaker, the app is required to download the necessary software. After the first update, the speaker will automatically download new software with important bug fixes and new functionality as it becomes available (unless you disable AUTO-UPDATE FIRMWARE from speaker settings). The auto-update feature happens periodically in the background — there’s nothing you need to do. You may notice the lights glowing on top of the speaker or it making the power-on sounds after a new update has been installed. We recommend keeping the auto-update settings enabled, but you can disable it at any time from Speaker Settings (the gear icon on the top right of the app). Do I need the app to connect to bluetooth? You do not need the app to connect your speaker and your mobile device over Bluetooth. See: “How do I connect to my speaker directly through Bluetooth?” for more information. Do I need the app to setup my speaker?